Because of its name, many people think buckwheat contains gluten or that it is related to wheat. That couldn’t be further from the truth! Though I am counting buckwheat as a gluten free whole grain, it really isn’t part of the cereal grasses family; it is considered a pseudocereal (along with amaranth and quinoa). Buckwheat is related to sorrels, knotweeds and rhubarb. Buckwheat noodles have been eaten by people from Tibet and northern China for a long time, as wheat cannot be grown in the mountainous regions. Buckwheat noodles also play a major role in the cuisines of Japan, Korea and the Valtellina region of northern Italy. 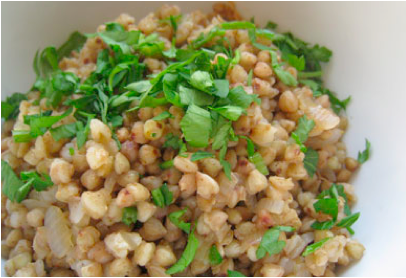 Buckwheat groats are commonly used in western Asia and eastern Europe. The dish made of roasted groats that has a similar texture to rice or bulgur called kasha (one of my favorite buckwheat dishes) made its way to America by way of Russian and Polish immigrants. And don’t forget about buckwheat pancakes, blinis, savory Brenton galettes or ployes! Buckwheat is adaptable to so many different dishes. To make basic buckwheat, cook one cup of buckwheat with 2 cups of water or broth. Bring to a boil. Cover, reduce heat and simmer over low for 20 minutes until cooked through. Remove from heat and let sit for 5 minutes before fluffing with a fork. In a saucepan, heat the olive oil over medium heat. Add the onion and saute until translucent. Add buckwheat groats, garlic, cumin seed, mustard seed and cardamom. Saute, stirring constantly, until the spices and garlic are fragrant and the buckwheat is lightly toasted, about 3 minutes. Add stock and salt to pan. Bring to a boil, then reduce the heat to medium low, cover and simmer until the liquid is absorbed, about 10 minutes. Remove from the heat and let stand, covered, for 2 minutes. Transfer pilaf to a serving bowl and sprinkle with cilantro.